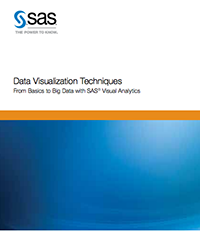 From Basics to Big Data with SAS® Visual Analytics. We just concluded a great Twitter chat sponsored by SAS Canada, speaking to solutions specialist Tim Trussell on how predictive analytics can benefit businesses, both small and large. Writer and tech analyst Carmi Levy moderated the chat. Carl Farrell, Executive VP, SAS America’s examines some of the challenges around big data and the effects on business.